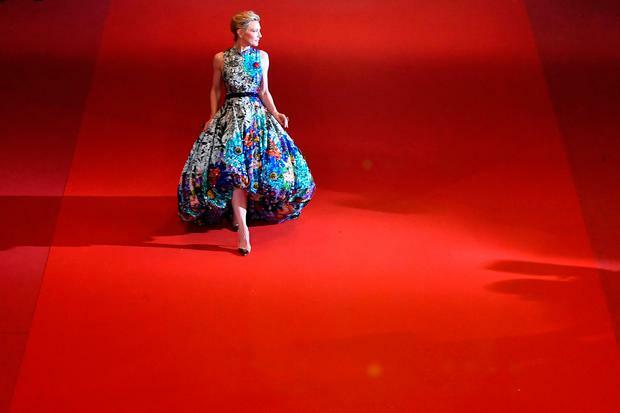 The two-time Oscar-winning actress is acting as jury president of the Cannes Film Festival and made her most jaw-dropping red carpet appearance on Thursday night for the premiere of Cold War. After opening the festival in a dazzling black lace Armani gown, she went for the real-life fairytale look in a custom Mary Katrantzou dress which took six months to create. The American designer was recruited by Blanchett's style team after the Carol star fell for her SS18 collection, to commission the piece, which she describes as a "dream come true". "The dress evolves from this black and white linear print on a racer-back bodice into an explosion of colour and texture in a voluminous asymmetric skirt," Katrantzou told Vogue. "I have admired Cate for her immense talent, intellect and grace for many years and have always thought of her as the epitome of the woman I aspire to design for." This year's festival has a distinctly more thoughtful atmosphere - in a post-Weinstein film industry, after the #MeToo movement, there is more of a focus on female representation, not only in the films they feature in, but behind the scenes as well. In particular, she was queried about the fact that out of the 21 films competing, only three were directed by women. "A few years ago there were only two, and I know the selection committee has more women on board than in previous years, which will obviously change the lens through which the films are chosen," she told a press conference earlier this week.